Remington is a brand we all know. It's a brand that holds its spot for most of us being your first hair tool. Remington always have been reasonable in pricing in my opinion. In time for Mother's Day, Remington has a key item of theirs that would appeal to a lot of us Mumma's out there. Blow drying my hair has never been something I am good at. I have very thick and easily knotted hair that I don't even bother with attempting to dry with the hair dryer simply because I'm too lazy after my showers. Generally most of the time I am a night time shower-er as I go to gym late nights so obviously need to show after that. Every second day I will wash my hair and because it's so thick it will take forever to naturally air dry so it was time for me to start looking for an option that would be somewhat easy and quick for me to dry my hair at night time so I don't have to be going to sleep on wet hair. I have always wanted to be able to whip my hair into that silk luscious and healthy looking TV commercial looking locks but the thought of trying to blow dry my hair was too painful to think about for very long so I never gave this a shot at home. I was kindly gifted a Remington Blow Dry In A Box (RRP $69.95) this Mother's Day to put to the test. This kit is a limited edition gift pack which contains a powerful 2300-watt dryer, radial brush and salon professional styling products from the hair care range Osmo, containing everyones favourite Argan Oil. You'll also find two (2) sectional clips as well as extra goodies. 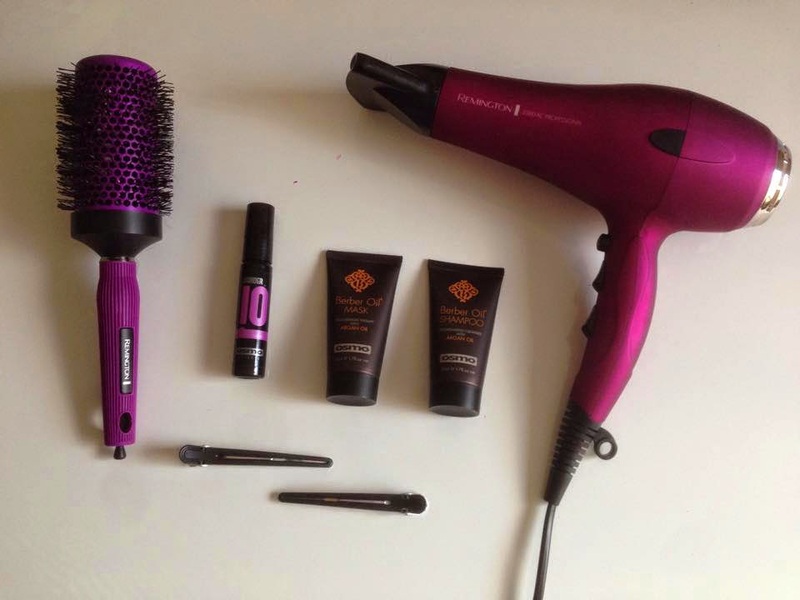 Remington Blow Dry In A Box comes with literally everything you will need to achieve that salon blow dry. In the comfort of your own home you can get some DIY pampering in. Due to the fact my hair is so thick I needed to do lots of different smaller sections to be able to get my whole head of hair dried completely. First time using the blow dryer with the radial brush I was getting my arms and hands all tangled with one another. The directions said to have the brush underneath the hair and blow dryer on top to blow dry, well that didn't seem to work for me. 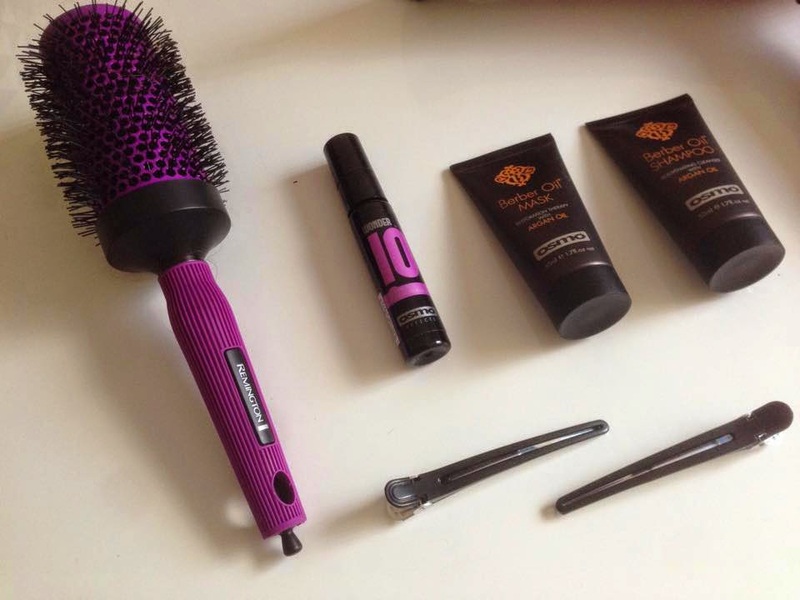 The other way round works best for me - hairbrush on top and blow dryer going underneath, place your radial hair brush onto the top of the hair and then slowly run the radial brush down the hair following along with the blow dryer. Majority of my hair after 2-3 strokes of the blow dryer going over it was dry but if there was some patches I would run the blow dryer by itself over it to get it all. 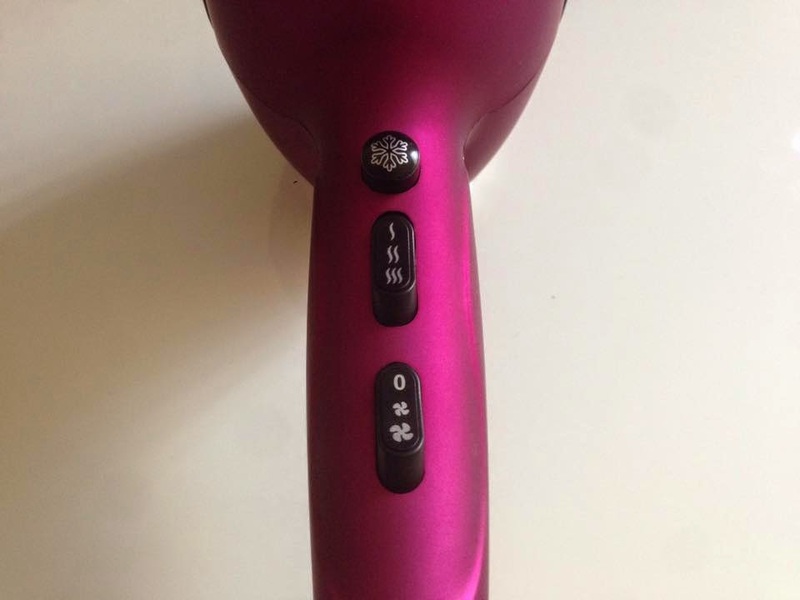 The Remington 2300-watt dryer is a pinky purple colour with 3 buttons in the hand held area. First button for the cool air to come out. Second button had three (3) selections where you change the heat intensity of the dryer. Third button is for the dryer speed. Be careful with the middle (second button) as the last one is very hot. A soft plastic glove like cover encases the hair dryer and provides a better grip for when in use. Roughly around 40cm in height and being of a medium weight this hair dryer is good sizing to use. I'm still learning the knack of how to do an overall good salon looking blow dry but for now I have to say thank you to Remington for allowing me to have all the tools I need to achieve that look. Practice makes perfect right. After blow drying just like in the salons I'll run the hair straightener over the top of it for a complete all over well nourished straight hair look. Product was provided for consideration in return for its promotion here. All opinions are my own. Fantastic post! I love all the reviews of this hair dryer. I think you got such a great gift on mother’s day. On my last birthday I also got a sedu hair dryer as gift from my husband. It is just fantastic and I love using that.